A pretty funny and entertaining movie. This is a smart and humorous animated movie. It’s not anything incredible or groundbreaking, but what we do get from this one is a movie that tells a very familiar sounding story and that finds ways to make it interesting and fun. The story of an alien who comes down to earth and of a kid who befriends it and has to keep it hidden, goes back to movies like E.T. Well, this time the “alien” is a giant robot. And there’s a government agent antagonist out to see it destroyed. Our protagonist, a boy named Hogarth, is caught in the middle. The movie tells this story of a small town, during the Sputnik time in American history, and really uses that setting to its full potential. The Iron Giant is a pretty entertaining animated movie. There’s a reason why this little film made almost two decades ago is still remembered today. 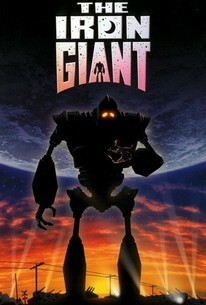 It’s the same reason why the director, Brad Bird, went from this to The Incredibles to Mission Impossible: Rogue Nation. The reason is because there was so much talent and skill involved in this little movie. It was that this movie found a way to be pretty simple, and basic, in terms of its story, and yet to also be incredibly ambitious in its scope. And it’s the way that this small film finds creative ways to be pretty funny and smart. The movie is a period piece (which is pretty rare for animation,) and it takes place around the time of Sputnik, the Russian satellite that was the first satellite ever put into space. But the movie is not about that. And the fact that it uses that moment in history simply to setup the atmosphere and paranoia that was in the air during the time of this story is pretty cool. Because what the movie is about is something coming from space that nobody knows about or trusts. And there’s a lot of talk at diners (like the one where our main character, Hogarth’s, mom works,) and places like that, about what’s going on in the town, and what kind of disturbances are taking place at night. 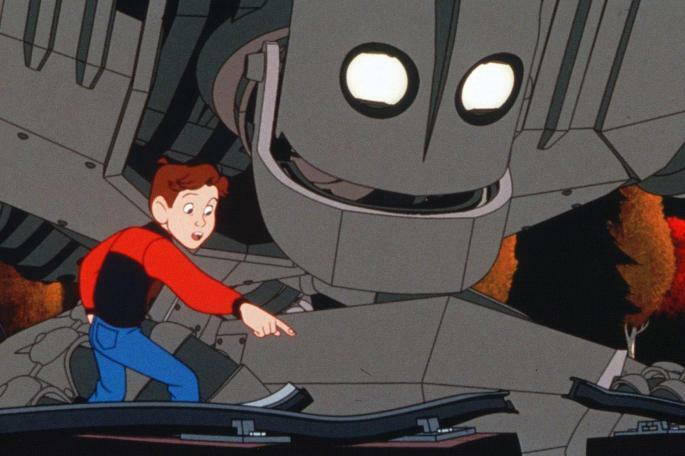 At the heart of the movie is this mysterious giant robot showing up in a small town causing all kinds of trouble. Before we meet the robot, we meet the boy. His name is Hogarth, and he’s a pretty adventurous kid. Hogarth lives at home with his single mom (voiced by Jennifer Aniston,) and he has a lot of time on his own, since his mom seems to constantly be at work, trying to make enough money to support them. Hogarth and his mom live in a nice, two-story house, and they have an extra bedroom to spare. They’ve been trying to rent this bedroom out for ages, and have never gotten any takers. All of this will factor into the plot later on. One night, while Hogarth is at home alone and his mom is working late, he is watching zombie movies when something happens. The TV signal stops working. Hogarth goes outside to adjust the antenna and see what the problem is. And he comes across this giant robot walking around. He watch as the robot takes giant bites of metal things like cars or power lines at the electric power plant. Hogarth befriends the robot, but tells him that he has to go away and can’t stay at his house with him. Then Hogarth goes back home. The next day, a number of people wake up to find their property damaged. One farmer has a huge bite taken out of his tractor, and the guy who runs the power plant is not too happy. This brings in the authorities, and really the authorities are just one guy… He’s Kent Mansley, voiced by Christopher McDonald. This guy has the perfect voice for a villain, and he’s got all the snark and sleaze one can imagine He demonstrated this nicely in Happy Gilmore, playing Shooter McGavin, the rival golf pro to Sandler’s Happy (in what is absolutely one of the best Adam Sandler movies,) and here, he’s just as good as a man on a mission to destroy the robot at all costs. Mansley comes to the town as an investigator. He’s there on behalf of the government to ask questions and find out what’s going on. But he’s not exactly nice in his approach. When people ask him if something big is happening, he makes comments like, “big things only happen in big places.” He doesn’t like the town and wants to get out of there, and back to Washington, as soon as he can. Mansley even makes fun of Hogarth’s name, after he first meets the boy and then drives away. And this is just his introductory scenes. As the movie goes on, his character will get worse and worse and end up doing all sorts of awful things. But at first, he’s just trying to find answers, and Hogarth knows from the very beginning that this guy has an evil agenda up his sleeve. For that reason, Hogarth doesn’t tell Mansley anything. And for a while, he’s able to get away with it, and still find ways to spend time with the robot during the days. He sits down on the ground with the robot and tries teaching him how to talk. And hearing the robot try speaking with this deep metallic voice, is pretty cool. The first words are rock and tree, and even those two aren’t so easy for the robot. When Hogarth realizes he needs a place for the robot to stay, he finds a guy named Dean, who he met at the start of the film. Dean works at a metal scrap yard, where he makes art out of the scrap metal, and when Hogarth sees this, while out walking with the robot, he senses it’s the perfect fit. Hogarth shows up at Dean’s door with the robot, and somehow convinces Dean to let the robot stay. For the night. Only that one night turns into the next day and then into a semi-permanent situation. And good thing too, because Hogarth is no longer able to sneak out so easily. The reason for that is because Kent Mansley has now taken up residence at Hogarth’s house. That’s right. He is the one renting the room that Hogarth and his mom have long been trying to get someone to take interest in. And this room happens to be right across from Hogarth’s. Having Mansly spend more time around Hogarth and his mom leads to him learning things from them. The mom, for example, tells Mansley about the giant robot that Hogarth saw. And at one point, the robot hand even finds its way into the bathroom upstairs while Mansley is in the house. That leads to a pretty funny scene with Hogarth on the toilet and Mansley getting his head slammed in the door. But the stakes get bigger and bigger as Mansley begins to lose it and start showing his true colors. First he threatens Hogarth with the idea of taking the boy away from his mom. Then he drugs Hogarth. And then he calls in the military to come with him to raid Dean’s metal factory. Who would have thought the villain in a kids movie would be so terrifyingly horrific? Luckily Dean is prepared and has a whole solution in place. Mansley get humiliated in front of the military that he called in, and the Head General (voiced wonderfully by John Mahoney,) is none too happy. But when the military leaves town and turns around to see the robot walking around in the distance, (he had to break cover to save two little kids who were about to fall to their deaths,) there’s no more hiding from the truth. The military comes back and it’s an all out war. The robot goes on defense mode and his appendixes start turning into all kinds of cool weapons. And Mansley steals the general’s walkie talkie and orders the dropping of a nuclear weapon. It’s a huge climax and the perfect one for this movie. This is a smart film that might have a simple plot, but it uses that to build in all kinds of interesting directions.